According to Jacob Aagaard in his book ‘Calculation’ (Grandmaster preparation) the more important skill is seeing. Of course! You can calculate like a madman, but if you don’t have a clue about what to calculate it doesn’t make much sense. You need to have some idea about possible candidate moves. See the diagram. The position is from a game between Pogos Nakhapetiane against Sergei Zhigalko (Olginska 2011). Sergei is quite a strong player from Belarus with a present rating of 2678. So you expect him to see more than the average patzer. It is black to move. Black sacrificed the exchange and seems to have an attack on the white king. But do things work out? What should he play? He played the lackluster 27. … Bxd1 28. Rxd1 and was worse although he did manage to draw the game at move 42. Could he have done any better? Of course this question is raised by Aagaard. And yes, he could have done much better. But I don’t think it is easy to see. Of course we all look immediately at 27. … Nb3+ I am quite sure a guy like Zhigalko also looked at this move. You don’t need to be a chess wizard to calculate 28. Nxb3 Rxc4 29. Nxa5 Bxd1 30. Nxc4 Bxf3 and white has a winning advantage. Is there any better? Let’s give it another try. After 28. Nxb3 black can play 28. … Bxb3 29. Qxc8+ Bf8 30. a3 what else? 30. … bxa3 31. Rd8 … Here it got a bit murky for me. 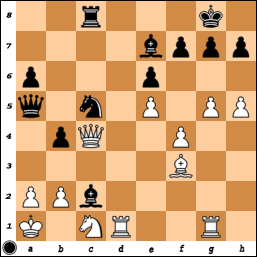 I tried to solve this problem from the diagram in the book and could not see how black would cope with the mating threat Rxf8 without losing serious material. I ran out of ideas. Like Sergei? Who knows. The solution is all about vision. Something that is clearly my limitation and seemingly sometimes the limitation of very strong players. Maybe I should have asked myself the question: if 27. … Nb3+ doesn’t work immediately, can I make it work on for instance the next move or so? That would have been a superb question and might even have uncovered the correct answer. Do you see it? Probably you do now. I found the solution in the book was not correct for this puzzle – it leads to a draw, nothing more. White has Qd4.